GREENVILLE, SC — An abortion facility in South Carolina and a branch of the nation’s largest medical waste company are under investigation after abortion facility representatives were captured on camera transporting “infectious waste” to a gas station, where they would meet up with their hauler, Stericycle, to transfer the boxes for disposal. The South Carolina Department of Health and Environmental Control (DHEC) recently sent a notice of alleged violation to Greenville Women’s Clinic and Stericycle after an individual with the group Created Equal submitted video footage of the abortion facility representative meeting up with Stericycle at the local Quick Trip. 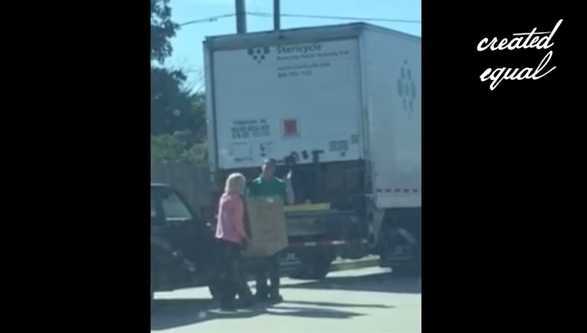 The videos, recorded in June and October, show a representative from Greenville Women’s Clinic leaving the abortion facility and then pulling into the Quick Trip gas station, where they parked behind the Stericycle truck and handed off a medical waste box to the driver. View the videos here, here, and here. The letter from DHEC also cites two more recent incidents on Jan. 10 and 31. Read the letter here. “The representative of Greenville Women’s removed a biohazard marked box from the passenger seat of the vehicle, and the Stericycle driver accepted the waste for transportation and loaded it onto the transport vehicle,” the notice of violation reads under the Oct. 18 outline. DHEC outlines that this activity violates South Carolina infectious waste management regulations as: 1) the personal vehicle used to drive the box to the gas station was not registered with the Department to transport hazardous waste, nor was it marked as mandated to notate to the public that it was transporting infectious waste and 2) the gas station is not a designated or acceptable transfer facility. The Department’s letter to Stericycle also noted that the medical waste giant failed to ensure that waste is only transferred at an allowable facility, and it additionally failed to obtain what is called a “manifest” from the abortion facility representative, a required document that outlines the number of boxes collected and the weight of each box. “Stericycle transferred infectious waste from Greenville Women’s transport vehicle to the Stericycle transport vehicle at the Quick Trip gas station, which is not a designated (permitted) transfer facility (location),” the notice reads. However, the violation notice submitted to the abortion facility notes that “Greenville Women’s … states it generates between 50 and 999 pounds of infectious waste in a calendar month,” which would suggest that the weight comes from more than just bloodied gowns and gloves. The DHEC considers Greenville Women’s Clinic as a “large quantity [waste] generator,” according to the letter. As previously reported, in 2015, Stericycle was found to have unlawfully dumped the remains of aborted babies from Greensville Women’s Clinic into a landfill after steam-sterilizing the boxes, instead of incinerating them as required by law, as the medical waste boxes were not properly labeled by the abortion facility. Stericycle has claimed for years that it does not accept fetal remains for disposal and has denied that it has been engaged in doing so. However, in addition to the 2015 matter in South Carolina, the medical waste giant was fined $42,000 in Texas in 2011 for dumping fetal remains from Whole Woman’s Health in Austin with household and commercial trash. “It was explained that medical waste is placed in red biohazard bags, then placed into boxes provided by Stericycle. Each fetus resulting from an abortion is placed into a hard plastic container and then into a red biohazard bag. The bag is then placed into a freezer, where it is stored,” an investigative report from the Texas Commission on Environmental Quality (TCEQ) outlined. The Campaign to Stop Stericycle, which has been working to expose Stericycle’s collection, transportation and incineration of aborted babies, also notes that grand jury documents surrounding the criminal case of convicted Philadelphia abortionist Kermit Gosnell outline that Gosnell used Stericycle to dispose of aborted babies as well. “James Johnson, who worked for Gosnell since 2001, testified that his duties included collecting the red biohazard bags of fetal remains and putting them in boxes for pickup by an outside firm, Stericycle,” the Grand Jury Presentment explained. The Campaign to Stop Stericycle had conducted an investigation into the company’s practices and was told that representatives do not inquire about the contents of the boxes collected at abortion facilities. However, the company provides the facilities with “incinerate only” stickers for “pathological waste” containers—those containing body parts and fluids.